Skinny jeans are skin-tight and tapered at the ankles. While skinny jeans look suitable with heels and sandals, many people also wear this style of jeans with sneakers. Wearing sneakers with skinny jeans is acceptable, though the best type of sneakers to wear are those with thin soles because bulky shoes may detract from the entire look. When wearing skinny jeans, you should remember that because the pants are so tight, the type of shoes you wear may enhance your leg or make it appear bulky. 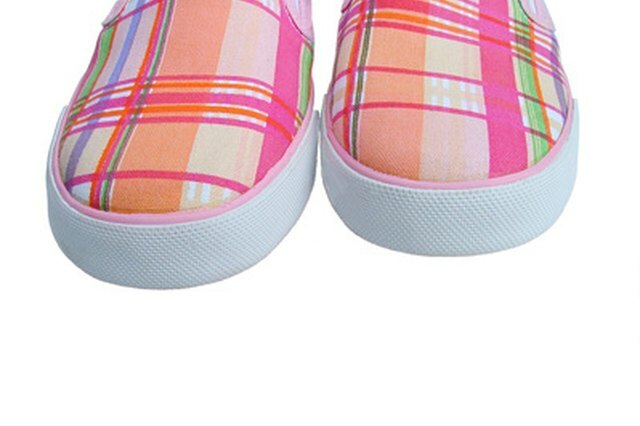 Choose a sneaker that has a low-profile, such as a pair of slip-on flats. Low-profile sneakers that slip onto the foot will create an illusion that the leg is longer, since the footwear is not so overwhelming to the outfit. Avoid wearing sneakers with chunky or bulky soles, like work boots or cross-trainers. Since the skinny jean is so tight, larger shoes will make the entire foot appear larger, and overwhelm your outfit. Tuck your skinny jeans into high-top sneakers. 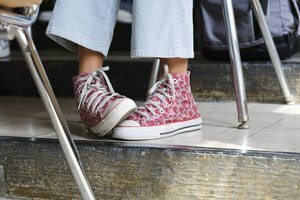 Old-school high tops add to the entire look and if you prefer a retro clothing style, high tops are a suitable choice. Wearing your skinny jeans tucked into high top sneakers will make the leg appear longer and slimmer. The Fashion Police: What trainers should I wear with skinny jeans? How Tight Should Leggings Fit?